Here at Forex fury, we frequently test and analyze other robots to learn from them, lately we’ve had great success with the trading robot that’s been on the market for over 5 years, Forex Steam. This trading system provides traders with a light version and a normal version as part of the same affordable package priced at just over $100. In my estimation, this is the most effective trading robot for beginners with a small budget. The robot is owned by STEAM LTD, and their offices can be found at 1635 Cork Street EAst, Guelph, Ontario, Canada. If you ever need support for the system, they have staff available 24/7 via support @ forexsteam.com. There is currently no phone support available, as email provides much easier solutions when it comes to technical products. Okay, maybe the tagline is a little more aggressive than it needs to be, but I want to stress the importance that the Forex Steam EA is having on the lives of the Forex fury staff. When we first started writing the code for fury we reached out to many different EA developers for help so that we can better our market understanding from different angles and expert opinions. In this process we found a lot of resistance from the Forex robot community, and the only coders that were willing to collaborate were those at Steam. This helped us immensely in the creation of our product, and so now it’s time that we pay that back properly. The Steam robots trade the EURUSD on the M5 and M30 timeframes. While there are 2 versions, the light and the normal, my runaway favorite is the light version. This version of the software has been updated over 60 times in the past 5 years and is now an incredible winning machine at version 9. Every single one of these updates has continued to be free for the clients of the software, and it’s been rumored for a couple of months now that version 10 will be another free update just around the corner. 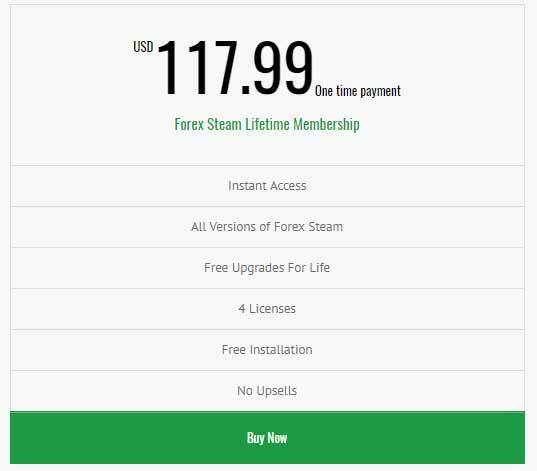 What I really like about this, is that there are hundreds of Forex steam clients that have the software for 5 years at a small investment of just over $100. During this time, the average trader has likely earned somewhere in the region of 100x to 1000x from their initial investment, which is phenomenal. Now, let’s take a look at some of the important features that make this robot as reliable as it is today. Continued testing and optimizing, including free updates. 4 licenses that can be spread over live and demo accounts. Years of verified and independent trading results. A small one time payment of $117.99. In the last section, I went to over the frequent updates, as I feel that’s one of the major strengths of the Forex Steam robot. Yet, what I didn’t mention is that traders have access to 4 licenses, so they can essentially run for live accounts or just run one live account and 3 tester accounts. Or any combination that suits their current needs. I have multiple licenses of Forex Steam, because at the current price I want to have as many licenses is possible for testing purposes. There are many different settings that can be played with and this is another aspect of the EA that attracts me greatly. I test different pairs, take profit settings, stoploss settings, trailing stoploss settings, hedging settings, news filter settings and much more. Generally, I will have one live account and then 7 demo accounts where I test different settings and features. I have found that the regular settings are generally the most effective, but from time to time I can go on extended winning streaks by lowering the TP or taking advantage of the trailing stop feature that was added a couple of versions ago. Not only is the Forex Steam EA capable of winning 30 trades in a row, but it actually has the live trading results to back that statement up. Forex Robot Nation has also supplied a trading account for the past few years. What you can see in these results, is that the software has started with a very small deposit, and exponentially increase these numbers with basic money management and long winning streaks. There isn’t a single robot in the market that has as much history, and historical success to back it up. The Forex Robot Nation results really show how the software can perform. Unlike other EA’s, steam has been able to achieve very high ratings on all of the most popular Forex review websites. 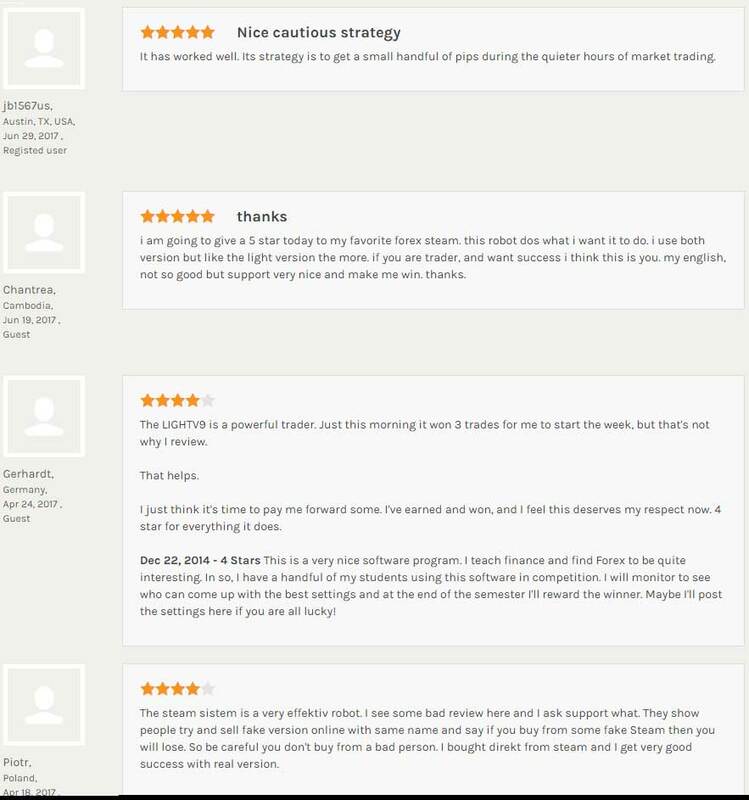 Real customers frequently discuss how impressive the software is, and the different types of adjustments the system has helped them make in their daily trading. There are few other trading systems that can compare to what Forex Steam has offered the Forex robot community. The stability of this system has forced other developers for years to look for new ways to technologically advance and improve. The system is a staple and a must own for every trading arsenal. I have been with Forex Steam for many years now and I am very happy with their trades. The light version continues to be a stalwart in my trading arsenal, and for a system price at $119.99, it’s made me in the thousands. Definitely the type of product built for all traders, and something that can be modified and adjusted to work for even the experts. Thank you for your feedback Don. It’s much appreciated, and goes a long way for potential traders.